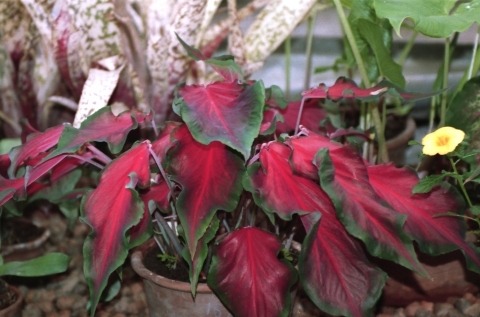 One of the many leaf forms and colour variations of this species. Angel wings is a herbaceous perennial plant producing a cluster of colourful leaves up to 80cm tall from a tuberous base. Although no specific mention has been seen for this species, it belongs to a family where most of the members contain calcium oxalate crystals. This substance is toxic fresh and, if eaten, makes the mouth, tongue and throat feel as if hundreds of small needles are digging in to them. However, calcium oxalate is easily broken down either by thoroughly cooking the plant or by fully drying it and, in either of these states, it is safe to eat the plant. S. America - Brazil, Bolivia and Peru, north through Central America to Mexico. A plant of lowland to moderate elevations in moist tropical areas. Useful in treating Ganglion cyst or Bible cyst. Ganglion cysts are very common lumps within the hand and wrist that occur adjacent to joints or tendons. The most common locations are the top of the wrist. , the palm side of the wrist, the base of the finger on the palm side, and the top of the end joint of the finger. The ganglion cyst often resembles a water balloon on a stalk and is filled with clear fluid or gel. How is it used? Dig and uproot the Caladium plant, cut its onion-like base and apply its sticky whitish substances on the affected swollen part of the hand. Add some Vaseline or any body oil at the affected area. It has a burning feel when applied on the skin. We highly use it hear in Africa and we have used it for centuries and centuries.